Located in one of the most active seismic and volcanic zones in the world, Japan is frequently affected by earthquakes and volcanic disasters. JMA operationally monitors seismic and volcanic activity throughout the country and issues relevant warnings and information to mitigate damage caused by disasters related to earthquakes, tsunamis and volcanic eruptions. To monitor earthquakes, JMA operates an earthquake observation network comprised of about 200 seismographs and 600 seismic intensity meters. It also collects data from over 3,600 seismic intensity meters managed by local governments and the National Research Institute for Earth Science and Disaster Prevention (NIED). The data collected are input to the Earthquake Phenomena Observation System (EPOS) at the headquarters in Tokyo and the Osaka District Meteorological Observatory on a real-time basis. When an earthquake occurs, JMA immediately issues information on its hypocenter, magnitude and observed seismic intensity. If the seismic intensity is 3 or greater, the Agency issues a Seismic Intensity Information report within one and a half minutes. The information is provided to disaster prevention authorities via dedicated lines, and reaches the public through local governments and the media. This information also plays a vital role as a trigger for the initiation of rescue and relief operations related to earthquake disasters. Seismic intensity describes the scale of the ground motion at a particular location. It varies with the distance from the epicenter and the surface geology at each point. JMA's seismic intensity scale has 10 degrees (0 (imperceptible), 1, 2, 3, 4, 5 lower, 5 upper, 6 lower, 6 upper, 7). The seisimic intensity is measured with a seisimic intensity meter. 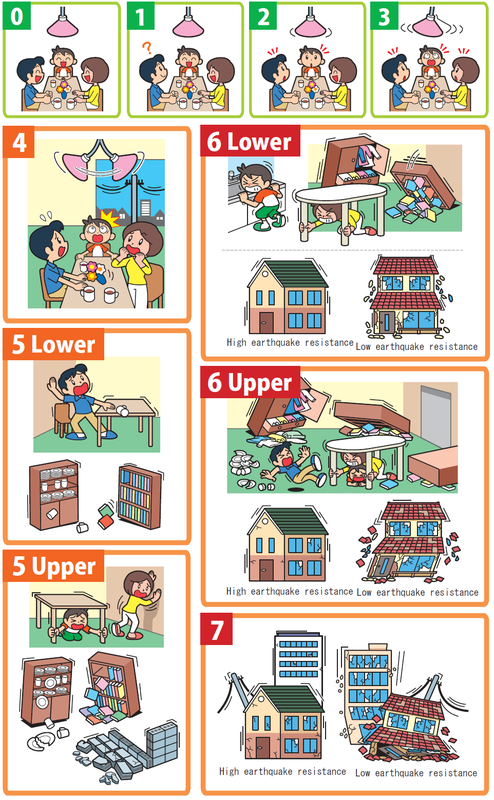 "Tables explaining the JMA Seismic Intensity Scale" describes the situations and damage which may be caused by seismic motion of each seismic intensity. The Earthquake Early Warning system provides advance announcement of the estimated seismic intensity and expected arrival time of principal motion when an earthquake occurs. These estimations are based on prompt analysis of the quake's focus and magnitude using waveform data obtained from seismographs near the epicenter. The Earthquake Early Warning system is aimed at mitigating earthquake-related damage by allowing countermeasures such as promptly slowing down trains, controlling elevators to avoid danger and enabling people to quickly protect themselves in various environments such as factories, offices, houses and near cliffs. To reduce and mitigate catastrophic losses caused by tsunamis, immediate provision of tsunami information for coastal regions is essential. 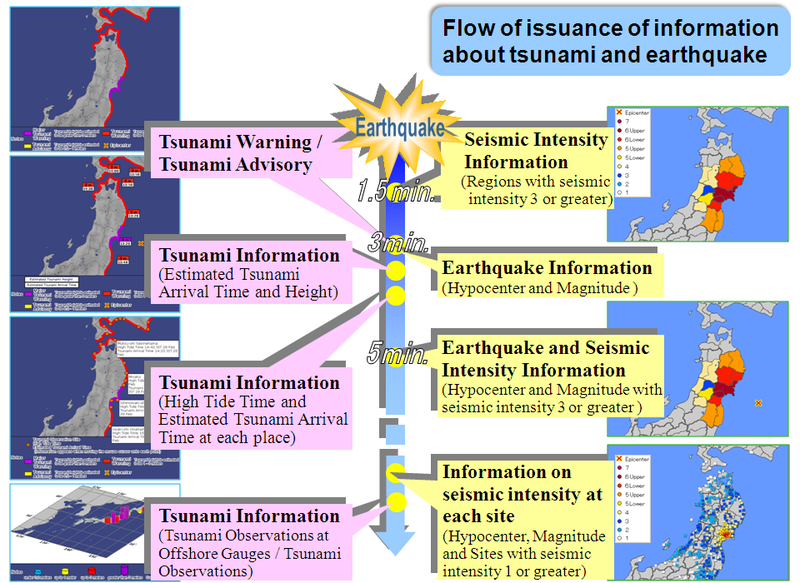 When an earthquake occurs, JMA estimates the possibility of tsunami generation from seismic observation data. If a damaging tsunami is expected in coastal regions, JMA issues a Tsunami Warning/Advisory for each region within around two to three minutes of the quake. If tsunamis are generated by seismic events far from Japan, the Agency engages in coordinated action with the Pacific Tsunami Warning Center (PTWC) in Hawaii and issues warnings for long-propagating tsunamis. Along the Nankai Trough, megathrust earthquakes with a magnitude 8 or more occur repeatedly. These are generally referred to as Nankai Trough Earthquakes. 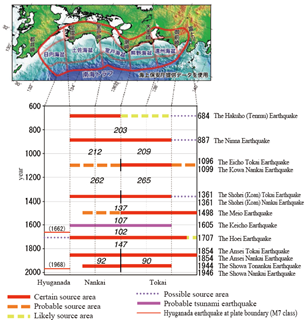 Although Nankai Trough Earthquakes occurred with a roughly 100 – 150 year cycle, they have various repetition intervals and source areas. More than 70 years have passed since the last two Nankai Trough megathrust earthquakes (the Showa Tonankai Earthquake and the Showa Nankai Earthquake), suggesting that another one may be imminent. 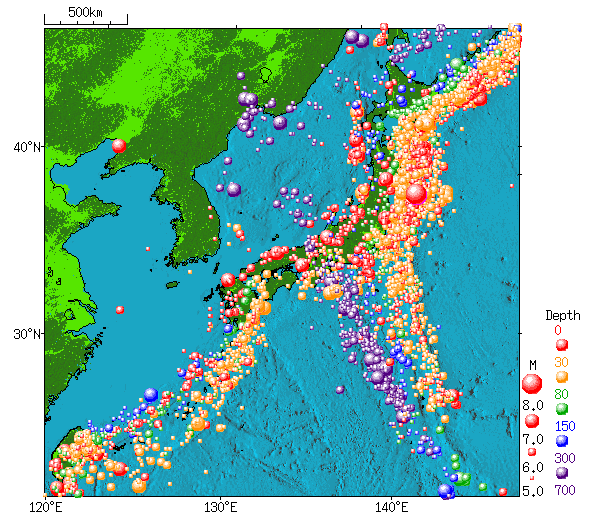 If phenomena suggesting changes in plate coupling (such as crustal deformation accompanied by slow slip at a plate boundary) are detected along the Nankai Trough, the potential for earthquake occurrence is considered to be higher. 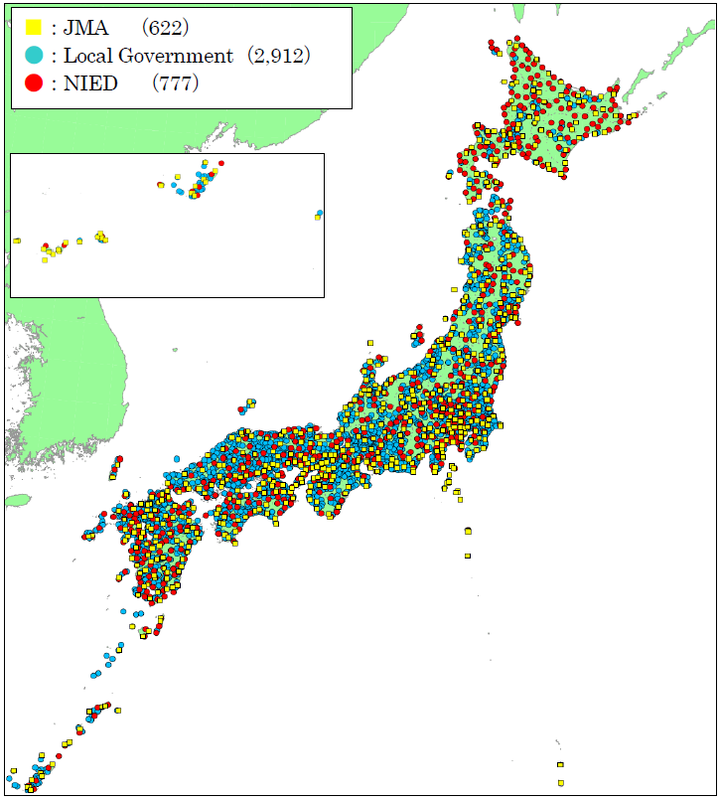 JMA has developed a seismic and crustal deformation observation network in and around the region in conjunction with related organizations, and monitors seismic activity and crustal deformation around the clock. If anomalies are detected along the Nankai Trough, JMA convenes the Nankai Trough Earthquake Assessment Committee for discussions on the expected potential for earthquake occurrence and issues Nankai Trough Earthquake Information (Extra) to the public via the JMA website and other channels such as TV and radio. The accuracy of earthquake forecasting is limited with current scientific expertise. The Nankai Trough Earthquake could occur at any time without the opportunity for issuance of related information in advance. Accordingly, it is important to prepare for the large earthquakes as part of daily life. Even if the potential for Nankai Trough Earthquake occurrence is assessed as higher and related information is issued, the earthquake may not occur. There are 111 active volcanoes in Japan; on average, a total of 15 volcanic events (including eruptions) occur every year, some of which seriously hinder human life. 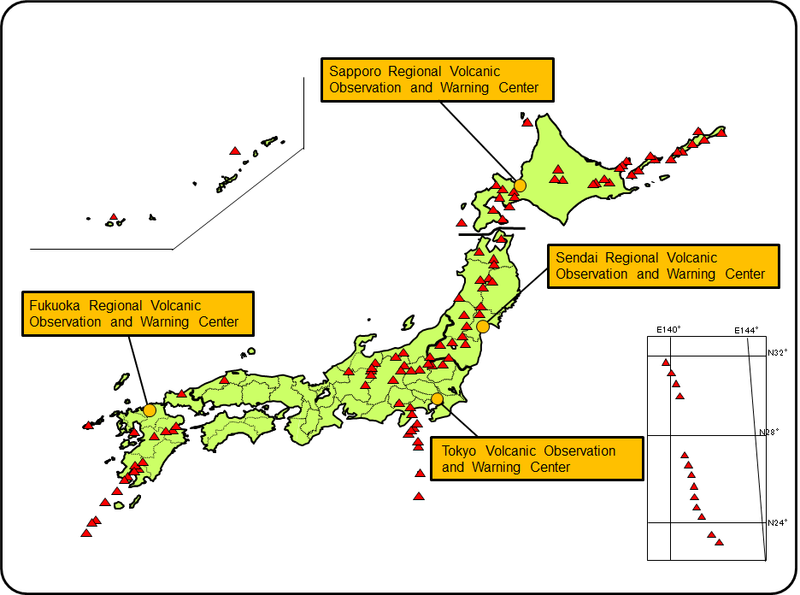 To continuously monitor this volcanic activity, JMA deploys seismographs and related observation instruments in the vicinity of 50 volcanoes that are remarkably active. Mobile observation teams are sent to other volcanoes for regular patrols. When volcanic anomalies are detected, the Agency steps up its monitoring/observation activities and publishes volcanic information and regular bulletins. In order to detect unusual volcanic phenomena and issue volcanic information appropriately, JMA operates Volcanic Observation and Warning Centers at JMA Headquarters and at the Sapporo, Sendai and Fukuoka Regional Headquarters of JMA, which integrate various types of observation data and monitor volcanic activity in their areas of responsibility. JMA began issuing Volcanic Warnings and Volcanic Forecasts for each active volcano in Japan on Dec 1, 2007 to mitigate damage from volcanic activity. Volcanic Warnings are issued in relation to expected volcanic disasters, and specify the municipalities where people need to take action. Volcanic Forecasts are issued for less active volcanoes or those that become so. The Coordinating Committee for Prediction of Volcanic Eruptions was established in 1974 under the Volcanic Eruption Prediction Plan. The Committee is comprised of experts from the academic community and related organizations, and the secretariat is located at JMA. The group periodically reviews volcanic activity in Japan and provides outlooks on volcanic eruptions when required. - What is an Eruption Notice?